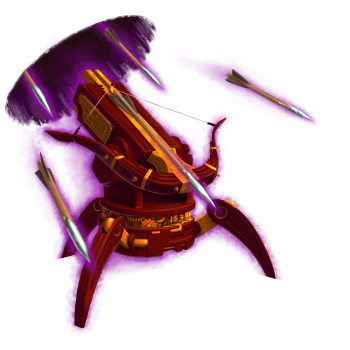 The Interdimensional Crossbow Trap is an Shadow type weapon. These finely-tuned crossbows create an interdimensional network between all other Interdimensional Crossbow Traps in existence. In synchronization with each other, once one of the traps detects a mouse, each of the other traps opens a portal to the offending location so that they may aid by opening fire upon the same target at once! It makes you wonder why all traps aren't made this way! The Interdimensional Crossbow Trap can be purchased for 5,360,000 gold, 10 Silver Bolts, 25 Bloodstones and 100 Howlite from the Fort Rox Trapsmith. It cannot be refunded. Goldfrost Crossbow Trap - Requires Interdimensional Crossbow Trap Parts for crafting. 3 November 2016: The Interdimensional Crossbow Trap was introduced.